Google Analytics is a powerful, free tool. Because it isn’t charged by account, and because there are lots of good reasons to create multiple accounts, often power users can find themselves with more than one. Sometimes lots more than one. The web front-end lets you look at data in one profile at a time, but if you want Google Analytics data from Multiple accounts, what are your options? Select as many profiles as you want, define a query, and you have all your data, all in one place. Include account number, web property, and profile information into the data set as if it were a dimension, for even more flexibility and analysis potential. A key example here is including the currency code. Once you have that, you can do currency conversion on your eCommerce data, opening up all sorts of possibilities for reporting and analysis. 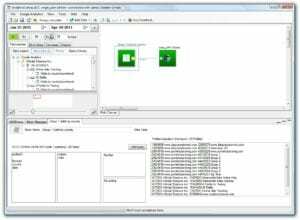 If you want to consolidate Google Analytics data from multiple accounts, and then write the data into a database, Analytics Canvas makes it easy. You will see all the profiles you have access to, you just select the ones you want to include (all of them if you like), define the query, and let Analytics Canvas do all the work, making as many API calls as needed, and caching all that data locally so you don’t need to query it every time. You can connect directly to Oracle, SQL Server, MySQL, MS Access, and to pretty much anything else using the ODBC capability and write all that data into a table- millions of rows if you’ve got them. Imagine the reporting on multiple profiles you can do when everything is combined into a single table, with profile, account, web property and currency information included as dimensions. 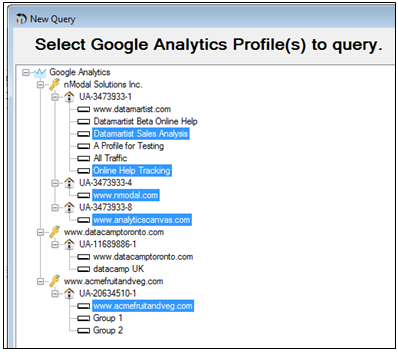 Check out this screen shot (click to enlarge): A multi profile query that pulls over 30 thousand rows from 18 differrent profiles across four Google Analytics accounts, and then writes the result into an SQL server database, all in one step. If you’ve got lots of Google analytics accounts, with lots of data, you need to give Analytics Canvas a try- all that data can be consolidated, with a lot less effort than you are probably putting out right now if you are using other tools and methods. Signup for the free trial, and you’ll be consolidating in no time. Also, be sure to check out our tutorial videos on the support page– tutorial 1 and 2 show you exactly how to do it.